Treasure is a fairly new trio from Brooklyn, although all three members are veterans of the local music scene — vocalist Amanda Tomme performed most recently with The Phenomenal Handclap Band, Caleb Lindskoog plays guitar with local rockers The Silver State, and Ryan Trott has played with the folk band Hologram. Treasure is built around the emotive and throaty vocals of Tomme, the full-bodied chord work of Lindskoog and tasteful and appropriate percussion by Trott. Each member compliments the others with grace, and as a result the songs are well balanced, richly melodic and melancholic without being gloomy. The new Treasure CD is called Tea Parties and is available in individually hand-painted 300 limited numbered copies. 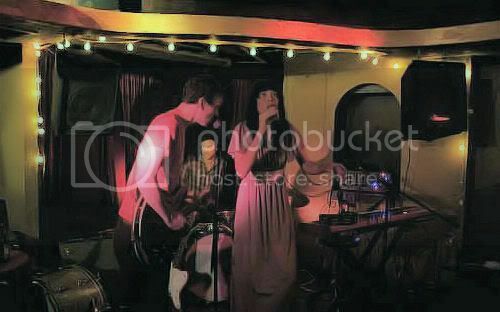 We captured Treasure‘s outstanding recent live performance at Glasslands. The show was recorded from the video-projection desk in the front of the balcony and the sound quality is excellent. Amanda’s vocals were originally mixed low, but that deficiency was corrected quickly. Enjoy! 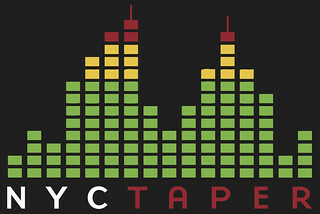 If you email nyctaper for access to this recording, we expect that you will PLEASE SUPPORT Treasure, visit their website, visit their MySpace page, and purchase their limited edition CD from the links at the Treasure MySpace page. huge new fan, i missed this show, thanks for the recordings!